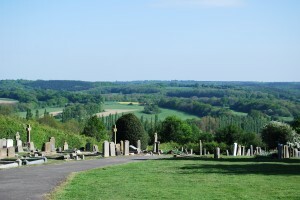 There are three burial areas in Goudhurst; St Mary’s Churchyard, The Victorian Cemetery, and The Burial Ground. Inside the church there are numerous memorials, notably those of the Culpepers of Bedgebury and the Campions of Combwell. St Mary’s Church is believed to date from the 12th century but it has undergone much alteration and extension since then. Stone memorials and headstones can be seen in the grass surrounding the church but many are in a poor condition and the inscriptions are no longer legible. Any wooden memorials that might have been erected to mark a burial have long since disappeared. 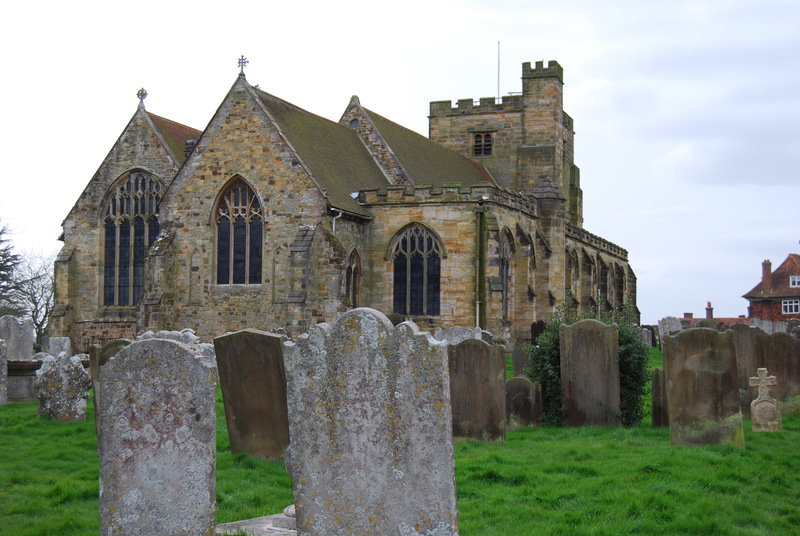 The Goudhurst & Kilndown Local History Society holds a transcript of burials from 1558 but we do not hold a complete plan of burials in the churchyard. Thanks to the work of Leland L Duncan in the late 19th and early 20th century, we have a record of many memorial inscriptions in St Mary’s churchyard. But, even in Duncan’s day, some were partly or wholly illegible. In 2016 the Local History Society compiled a revised plan of the churchyard memorials based on the numbering system used by Leland Duncan to identify the memorial inscriptions. Many of the inscriptions recorded by him have since become completely illegible and in a few cases headstones which existed at the time have now also disappeared. A transcription of Leland Duncan’s notes is available on the Kent Archaeological Society’s website. The inscriptions show burials from 17th century to the early 20th century. A new index to the names on the memorials which includes additional information has also been compiled. In our archives we also have some papers relating to burials in the 18th and 19th centuries. From 1666 a body was required by Act of Parliament to be buried wrapped in wool and not in any ‘foreign material’. The Act, and its subsequent replacement in 1678 and amendment in 1680, was intended to protect those involved in, and those whose work was dependent on, the wool trade. The use of other materials, including cheaper foreign imports, was not permitted and anyone found breaking the law would be fined £5.00. An affidavit had to be sworn in front of a Justice of the Peace or Mayor attesting that the burial had complied with the Act. The following is a transcript of an affidavit sworn by Susanna Wildish concerning the burial of William Wickham in Goudhurst. Unfortunately, punctuation did not feature in these early handwritten documents! that William Wickham late of Maidstone aforesaid Victualler deceased on the third day of January now last past was not put in wrapt or wound up or buried in any shirt sheet shift or shroud made or mingled with flax hemp silk hair gold or silver or other than what is made of sheeps wool only or in any coffin lined or faced with any cloth stuff or any other thing whatsoever made or mingled with flax hemp silk hair gold or silver or any other material but sheeps wool only. Sworn at Maidstone aforesaid the 7 day of February 1795. Before me one of His Majesty’s Justices of the Peace of and for the said Town and Parish of Maidstone. I William Fuggle Constable of the Hundred of Marden in the said County do hereby give notice to you and each and every of you that by virtue of a warrant or precept under the hand and seal of William Alexander Morland Esquire one of His Majesty’s Justices of the Peace for the said County to me directed and dated the 4th day of this instant April I have levied the sum of five pounds because the body of Elizabeth Pope late of Goudhurst aforesaid spinster deceased was buried in the Parish church of Goudhurst aforesaid in a linen sheet contrary to the statute in that case made and provided – given under my hand at Goudhurst aforesaid the 5th day of April 1803. This unpopular Act was eventually repealed in 1814. Within the churchyard there are some grander burials where graves are enclosed by railings and large memorials erected to the deceased, but in the main the graves are single width with relatively simple headstones to mark them. Immediately to the north side of the church tower is a more recent area of ashes interments. One memorial of note in the churchyard is that known locally as “The Pirate’s Grave”. It is so called because of the distinctive ‘skull and cross bone’ decoration on the headstone. The grave is actually that of Robert Fuller and can be found in the area to the area east of the church (on the left as you approach from the east gate). Another character buried here is William Sturt. William is famous for his part in the organisation of the Goudhurst Militia who defeated the infamous Hawkhurst Gang in the village in 1747. Unfortunately, his grave can no longer be identified. On 25 March 1872 a meeting of ratepayers of the village was convened for the special purpose of determining whether an additional burial ground should be provided for the parish and, if so, whether a Burial Board should be created. The resolution was passed and a Burial Board was appointed at their first meeting on 6 March 1873. The first Clerk to the Burial Board was Mr George Hinds. His family held the clerkship through three generations with George Parker Hinds and George Vernon Hinds following him until the latter’s retirement in 1959. 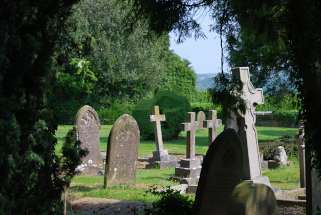 The new Burial Board agreed that a sum of money, not exceeding £550.00, should be borrowed so that land could be purchased from The Ecclesiastical Commissioners for the purpose of creating a new burial ground. Land to the south of the church was purchased and the Victorian Cemetery was created. Most of the cemetery land was consecrated but a strip along the eastern boundary was not. It was usual in Victorian times for folk of denominations other than the Church of England to be buried in unconsecrated ground. At a meeting on 29 January 1914 the Burial Board agreed to apply for the consecration of a further portion of the land in that eastern portion. The first interment in the new Victorian Cemetery was on 12 June 1874. The deceased was 82 year old William Parks, a plumber who had lived in the village. There is no memorial to mark his grave but we do know it is next to the south wall of the cemetery. There are some quite substantial memorials in the cemetery. In the north east corner are the four tombs of the Ridgway family. Alongside them and on the other side of the hedge is the Wickham family enclosure where the graves are enclosed by an iron railing. There is one military grave of a WW1 soldier, Private Frederick Arthur Jarvis. Frederick survived the war but fell victim to pneumonia on his journey back to England. He died in hospital in Maidstone in February 1919 aged 28 years. He was given a military funeral and a military headstone marks his grave. Date: 7 August 1903. Alfred Ashdown (Shear Cottages, Brandfold) Died 2nd August 1903 Aged 43 years. To oiled coffin having Black Furniture no 610 (Starnes Maidstone) with written plate & nailed with black nails, lined with swansdown. “King” size 6ft. 1in. x 1ft. 9in. The ledger shows that in 1903 the cost of an adult‘s coffin ranged from £2.00 for a very basic elm coffin to around £12.00 for a polished and engraved oak coffin. Babies’ coffins ranged from 8/6 to 1 guinea. Then 2/- per foot after 6 ft.in any section. There are no longer any plots available in the Victorian Cemetery but occasionally there are interments in previously purchased plots. By the early 1920s more ground was needed for burials and a strip of land to the south east of St Mary’s churchyard was purchased. The first burial was Charlotte Louise Davis, aged 64, on 13 November 1925. There is no memorial to mark her grave. There was a small area of unconsecrated ground at the lowest end of the sloping area of land. Only three burials have been traced in the unconsecrated ground. Over the years it has becoming more usual for people to purchase burial plots. To date just over 1000 plots have been purchased in the Burial Ground compared to about 300 in the Victorian Cemetery. By the late 1960s the numbers of cremations increased and the deceased’s ashes were interred in graves plots. To accommodate the growing numbers of ashes interments, a new area of smaller ashes plots was created to the north east of the Burial Ground. In 1965 a further strip of land lying between the existing Burial Ground and the Victorian Cemetery, and measuring 300 feet by 50 feet, was purchased from the owner, Mr Anthony Coleman of Parsonage House. Two areas of grave plots and two areas of smaller ashes plots were created. The Coleman family has its own private burial area to the north of the new strip, just as you enter the Burial Ground from Back Lane. While there are a lot of memorials and headstones in the Burial Ground, there is none of the lavish stonework and railings seen in the Victorian Cemetery. This was a uniquely Victorian “fashion”. A lot of the earlier graves are defined by kerbstones but, in more recent times, you will see that an engraved headstone is the usual mark of a grave. The Parish Council maintains the Victorian Cemetery and the Burial Ground. A great deal of work has recently been undertaken by volunteers, under the guidance of the Parish Council, to clear the overgrown shrubs and trees covering the graves in the Victorian Cemetery. It is an ongoing project. 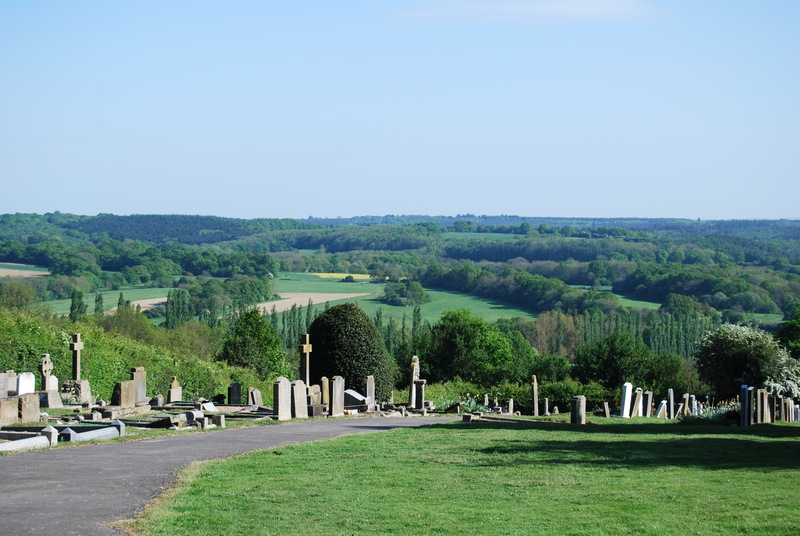 During 2013 and 2014 The Goudhurst & Kilndown Local History Society liaised with the Parish Council to create an up to date index and plan of the Victorian Cemetery and the Burial Ground. The History Society also holds a plan of some graves in St Mary’s churchyard. However, we can only identify graves where Leland L Duncan listed a memorial inscription. If you have any queries relating to burials in St Mary’s Churchyard, the Victorian Cemetery or the Burial Ground, please contact us. Please note that enquiries relating to the purchase of new burial plots should be addressed to the Clerk of the Parish Council.